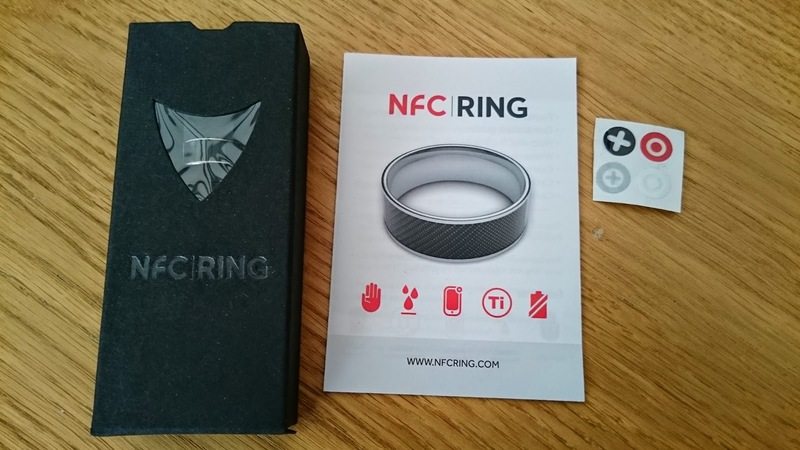 I'm looking for neat ideas to get the most from my new NFC ring. 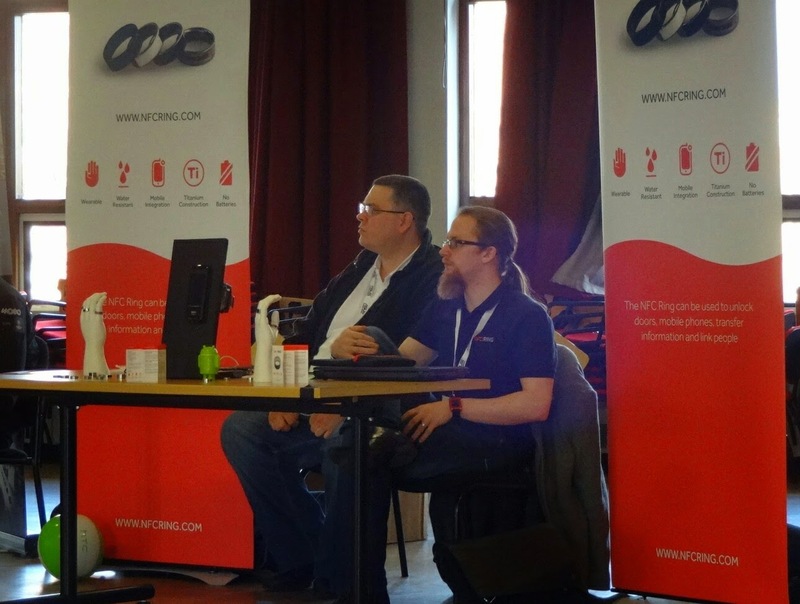 The March of the Droids event last month included a couple of NFC-related highlights. 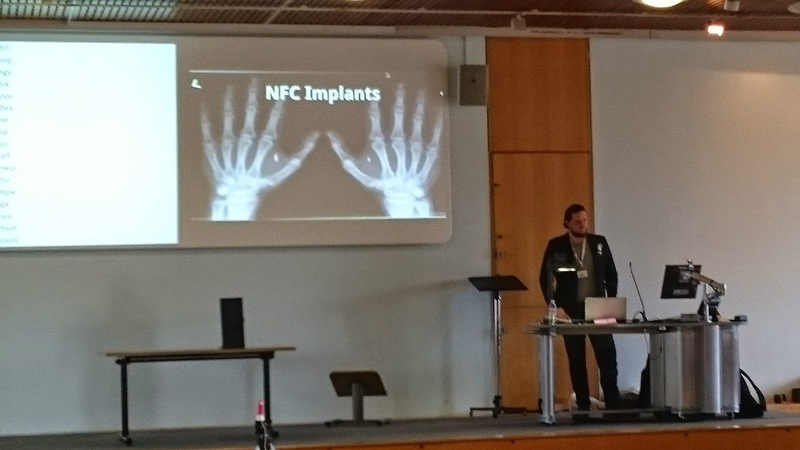 One was a presentation about NFC implants; the other was a trade stand for NFCRing.com. I was looking forward to both. For those who don't know, NFC (Near Field Communication) is a technology whereby a powered device such as an NFC equipped smartphone can exchange data with a passive NFC tag or another powered NFC device. The tag doesn't need any power (it draws what it needs from the other device). It's really short range - for all practical purposes, you may as well assume that the device and tag need to be touching to work. You can also use NFC between two powered devices (e.g. 2 smartphones) to initiate data transfer, such as sending a photo or your contact details to another phone, although the devices will generally use Bluetooth or WiFi direct for the actual data transfer; NFC is just used to set up the connection. The same technology is used in Credit Card machines (the powered bit) and modern Debit cards (the passive bit) for Contactless payments. Many Android and Blackberry phones and tablets have NFC radios, and the iPhone 6 and 6+ have it too, but Apple have restricted it so that it can only be used for Apple pay. Anyway back to the point. Mathew Bloomer Brack gave a fascinating presentation about NFC implants - or more specifically, his own NFC implant, which he had done having been inspired by the farming applications for controlling cattle gates depending on the data on the cows' ear tags, and his own inability to keep track of the tag he needed to open doors, etc on campus. I would have been more than happy to have an NFC implant myself - after all, it's much the same principle that vets use when they inject microchips into conscious puppies and kittens every day of the week, but £125 for the chip and implantation seemed a bit on the steep side when I wasn't really quite sure how I was going to make use of it (despite loving the idea just for the pure geekiness of it) ... and anyway, as it turned out, the guy who was going to be doing the implants couldn't make it to the event. Still, if you fancy a bit of implantation yourself, the place to start is http://dangerousthings.com/. Between presentations, I had some interesting discussions with Alex Sullivan (Customer Support / Ring Evangelist) from NFCRing.com who had a stand at the event, showing off their rather less invasive approach to "magic" door opening (amongst other things), namely the NFC ring, plus the Samsung NFC door lock. 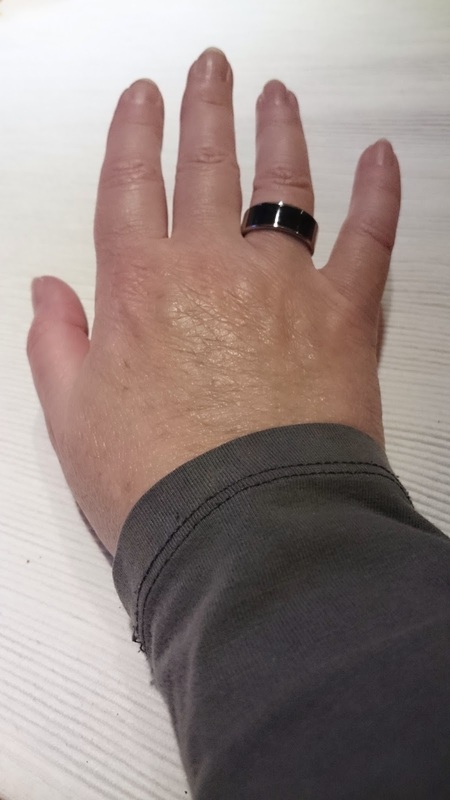 At £30, a ring seemed a much more affordable, if slightly less geeky, option. On a side note, we've had keyless remote door opening and ignition on our car for years, and it's really useful not to have to fumble for keys when you've got your hands full - or, if I'm honest, even when you haven't. I'd dearly love to have an NFC door lock for similar functionality on the front door of our house, but unless you go for something hideously expensive, they're only available for wooden doors at the moment, and our front door is a UPVC one. After the event, Andy and I headed out to Argos (the "proper" jewellers were closed on a Sunday) to determine what ring sizes we'd need, converted the UK sizes to US sizes, and I placed our order - the Signature, partly because I prefer the look of the black stripe on one side, and partly because having one black side and one clear side (you can see through to the circuitry) makes it easy to know which data is on which part of the ring. We've had a couple of days to play with them, and now we're looking for clever ideas on what to use them for. I've scoured the web for ideas, but almost all of the ideas that I've found are things that I can (and already do) do automatically without needing to tap my phone to anything at all. A lot of my phone use, and some of my home is already automated. My phone knows when it's at home because it knows what my WiFi network is called; it knows when I'm in the car because it automatically connects to the car bluetooth; it knows when it's time to switch into Sleep mode because - well, because it knows what time of day it is (and the Sleep agent that I use has a delay option that I can use if I'm out/up later than usual, and don't want my phone to go into quiet/sleep mode yet). 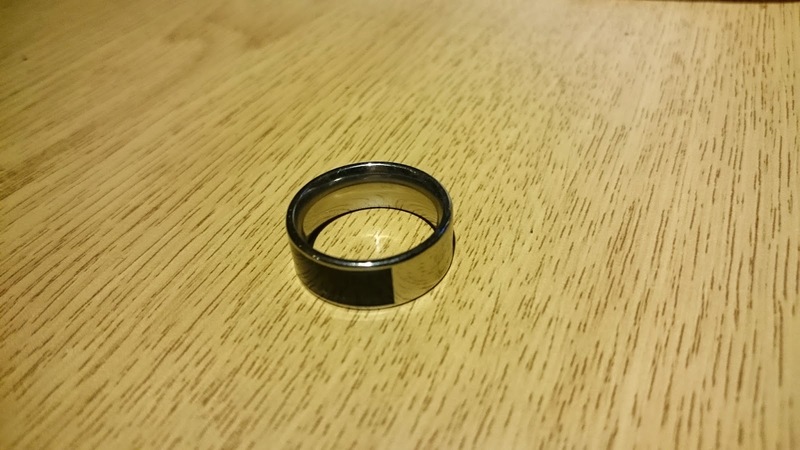 I use my SmartWatch as a trusted bluetooth device (in conjunction with SkipLock) to keep my phone unlocked as long as it's with me, so I don't need a ring to unlock it. The bottom line is that all the things like unlocking my phone, setting certain profiles, starting certain apps, etc., because I'm in a particular place or it's a particular time of day just don't need a tag at all. The car's (aftermarket) bluetooth unit is in the glovebox. so one vaguely useful one I can think of is to program an NFC tag so that occasionally when the car audio has decided to connect to the wrong phone, I can easily reconnect my own phone to it, without scrabbling in the glovebox or digging into the phone's bluetooth settings ... but even then, that's a job for a tag on the car dashboard, not for something I'm wearing. Alex from NFCRing has two useful things (for him) on his ring - a door key code (which, as I've already said, I'd LOVE to be able to make use of on my own front door, but can't), and an email stub with his email address, subject and a the start of a message, so that when you meet him at events, he can easily get you started on sending him an email message. For me, it's unlikely that I'll want to give my personal email address to somebody that I meet out of the blue, and the chances of using the technique with my work email address is pretty unlikely in the veterinary industry, where faxing information rather than emailing it is still surprisingly common. I currently have my blog address and my G+ URL programmed on mine, but that seems pretty boring, so I'm looking for some other ideas - things that I haven't already automated by time or location. So I'm open to ideas ...?